Doubler Stones on Addingham High Moor, west Yorkshire. OS Grid Reference: SE07230 46525. On the windswept Addingham High Moor, west Yorkshire, there stands the heavily weather-worn rocks known as ‘Doubler Stones’ – part of an outcrop of grit and sandstone rocks; their enigmatic rock-shapes being something of a great curiousity to moorland walkers down the years. These strange, weathered stones lie at the south-western edge of Rombald’s Moor. At least one of the Doubler Stones has cup-and-ring carvings, and a few other rocks here and further up the hill might have “possible” faint cup-marks. To reach the stones from the town of Silsden: take the Bolton Road going north-east, then east along Brown Bank Lane, then take Light Bank Lane over the moor to the south-east. Just after White Crag House: take the concrete track up to the gate, then walk along here to the house on the left. Take one of two footpaths north for a short while to Doubler Stones. 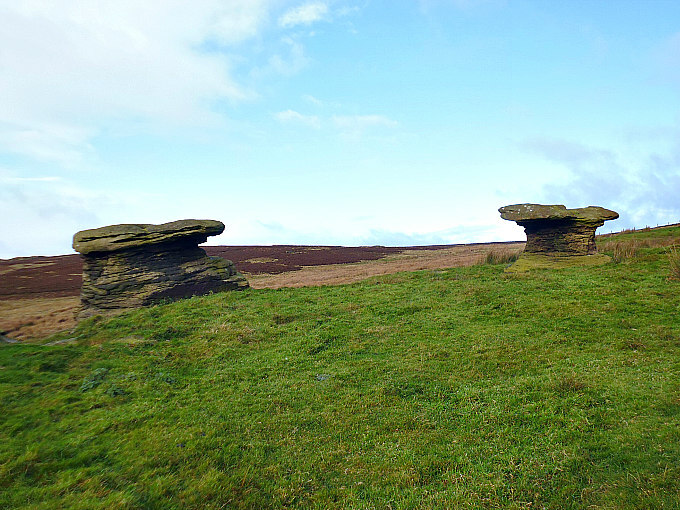 Ghostly shaped Doubler Stones in west Yorkshire. 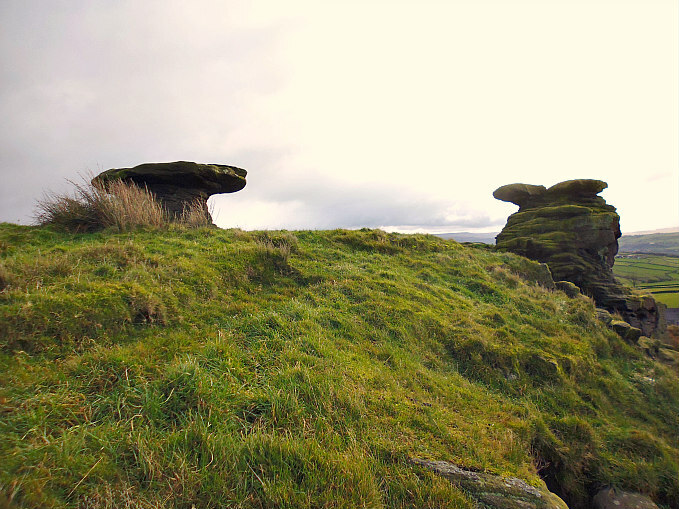 These strange-shaped rocks are part of an outcrop of gritstone and sandstone rocks that stand like weather-worn sentinels watching over the moorland. 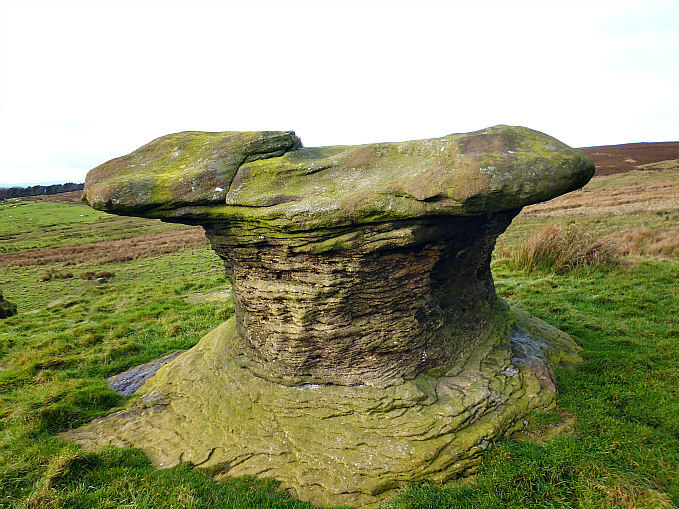 They have taken on the shape of giant mushrooms or salt and pepper pots, but here they are locally called ‘Doubler Stones’ but whether this is because there are two of them – is not certain. It’s more likely that the name “Doubler” is derived from saucer or dish-shaped stones and this is indeed what they are; the tops of the stones are gritstone rocks that are now eroded and saucer-shaped, while the lower parts are made of very soft Sandstone, and this is why the middle sections have eroded down quite severly and become, over thousands of years, like ‘thin waistlines’ or bottle-neck shapes. One of the Doubler Stones has what looks to be a cluster of tiny cup-marks and a few other “possible” cups with rings and interlinking channels or grooves. A few other rocks here might have faint cup-marks – although these could be geological features. Another outcrop of rocks just up the moor to the east is also of interest as there are a few more “possible” cup-markings on the larger rocks. One of the Doubler Stones on Addingham High Moor. Categories: Natural Stone Or Other, Naturally Formed Rocks | Tags: Doubler Stones on Addingham High Moor in West Yorkshire | Permalink.